Babblers is a large family of birds mostly found in the Old World (Europa, Asia and Africa), where they occur in tropical areas, with the greatest variety occurring in Southeast Asia. They are mostly resident (non-migratory). They vary in size and coloration, but all have a soft, fluffy plumage. These birds have strong legs, and many are quite terrestrial. This group is not strongly migratory, and most species have short rounded wings and are weak flyers. Babblers are generally social birds that are usually found in family groups and small flocks of up to about 20 individuals - typically foraging on the ground and loudly calling to one another. These opportunistic omnivores will feed on meat, plant material and / or berries. Ashy-headed Laughingthrush, Garrulax cinereifrons : Endemic to Sri Lanka, where it occurs in rainforests - usually in deep jungle or dense bamboo thickets in the wet zone. It is quite common at prime sites like Kitulgala and Sinharaja. This species is resident (non-migratory) and has short rounded wings and a weak flight. 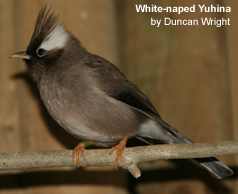 The Ashy-headed Laughingthrush measures about 23 centimetre (9 in) in length including the long floppy tail. It is rufous brown above and deep buff below, with a grey head and white throat. Like other babblers, these are noisy birds, and the characteristic laughing calls are often the best indication that they are present, since they are often difficult to see in their preferred habitat. It builds its nest in a bush, concealed in dense masses of foliage. The normal clutch is three or four eggs. They are usually seen in groups of up to a dozen, and are also often found in the mixed feeding flocks typical of tropical Asian jungle. They feed mainly on insects, but also eat jungle berries. 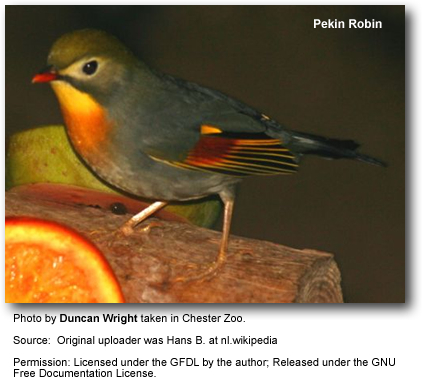 Genus Liocichla, the liocichlas: Found in Asia from India to China. They are Old World babblers proper and belong to a clade also containing at least the Leiothrix, the barwings, the minlas and the sibias. Among these, they are a basal lineage (Cibois 2003). Sooty-capped Babbler, Malacopteron affine Found in southeast Asia. 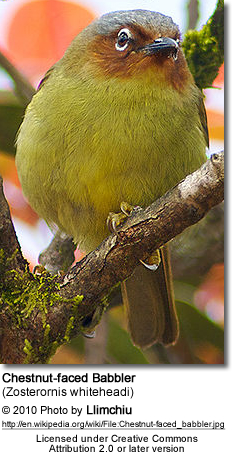 The Sooty-capped Babbler is also known in Malay as Rimba Tinjau Belukar. Its main diet is small insects. Naung Mung Scimitar Babbler, Jabouilleia naungmungensis : Found in temperate rainforest on steep, sub-Himalayan hillsides. It was discovered in February 2004 in the far north of Burma, and is named after the village of Naung Mung, the closest settlement to its discovery site. It is believed to be fairly common within its range. Due to its recent description, its conservation status has not been formally evaluated, however. Dark-fronted Babbler, Rhopocichla atriceps : Found in Sri Lanka, and in the Western Ghats of southern India. Its habitat is dense forest undergrowth and bamboo jungle. This species, like most babblers, is not migratory, and has short rounded wings and a weak flight. This babbler builds its nest in a bush, concealed in dense masses of foliage. The normal clutch is two eggs. 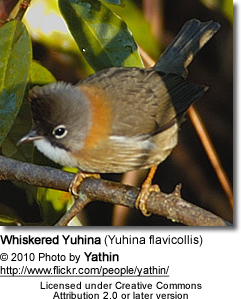 The Dark-fronted Babbler measures 13cm including its longish tail. It is brown above and white below. The two subspecies in the Western Ghats have black hoods, but the two Sri Lankan races have this reduced to a dark bandit mask. Dark-fronted Babblers have short dark bills. Their food is mainly insects. They can be difficult to observe in the dense vegetation they prefer, but like other babblers, these are noisy birds, and their characteristic calls are often the best indication that these birds are present. This bird-related article is a stub. Jerdon's Babbler, Chrysomma altirostre : Found in South Asia. The nominate subspecies from Myanmar, the Myanmar Jerdon's Babbler (Chrysomma altirostre altirostre) may already be extinct. It occurred in tall-grass habitat in the floodplains of the Ayeyarwady River from Bhamo to Bago and up the Sittang River nearly to Taungoo. It was last seen in July 1941 in habitat fragments at Myitkyo, wtith the last specimen taken in 1914 or perhaps as late as the mid-1930s. Due to the inaccessibility of its range and consequent lack of fieldwork, it might conceivably still exist. (Collar et al. 2001, BLI 2006) Of the Sind Jerdon's Babbler (C. a. scindicum) from the Indus basin and the Terai Jerdon's Babbler (C. a. griseigularis) of the sub-Himalayan plains, together less than 10000 mature birds are believed to remain. Its threat category VU A2c+3c (BLI 2004). This means that its population has declined by an estimated 30% and is expected to continue to do so for another decade at least. The reasons are not fully understood, but the population reduction is probably related to habitat destruction for agriculture and flood control. Rufous-tailed Babbler, Chrysomma poecilotis : Endemic to China. Orange-billed Babbler, Turdoides rufescens : Found in Sri Lanka. Its habitat is rainforest, and it is seldom seen away from deep jungle. This species, like most babblers, is not migratory, and has short rounded wings and a weak flight. Although its habitat is under threat, it occurs in all the forests of the wet zone, and is quite common at prime sites like Kitulgala and Sinharaja. It builds its nest in a tree, concealed in dense masses of foliage. The normal clutch is two or three deep greenish blue eggs. These birds are plain orange brown below, and have a slightly darker shade above. The crown and nape (back of the neck) are grey, and the bill is orange. The Orange-billed Babbler lives in flocks of seven to ten or more. It is a noisy bird, and the presence of a flock may generally be known at some distance by the continual chattering, squeaking and chirping produced by its members. It is usually the first sign that a mixed-species feeding flock, so characteristic of Asian wet forests, is in the vicinity. It feeds mainly on insects, but also eats jungle berries. Yellow-billed Babbler, Turdoides affinis : Found in Sri Lanka and southern India. Its habitat is scrub and cultivation. This species, like most babblers, is not migratory, and has short rounded wings and a weak flight. It builds its nest in a tree, concealed in dense masses of foliage. The normal clutch is two to four greenish blue eggs, although up to five may be laid by birds in the hills of Sri Lanka. These birds have grey brown upperparts, grey throat and breast with some mottling, and a pale buff belly. The head and nape (back of the neck) are grey. The race T. a. taprobanusi of Sri Lanka is rufous beneath, and more heavily streaked on the throat and breast. It resembles Jungle Babbler, Turdoides striatus, but that species does not occur on the island. The Yellow-billed Babbler lives in flocks of seven to ten or more. It is a noisy bird, and the presence of a flock may generally be known at some distance by the continual chattering, squeaking and chirping produced by its members. It feeds mainly on insects, but also eats fruit. Blackcap Babbler, Turdoides reinwardtii : Found in west Africa from Senegal to Cameroon. Its habitat is thick scrub and forest. This species, like most babblers, is not migratory, and has short rounded wings and a weak flight. It builds its cup-shaped nest in a tree, concealed in dense masses of foliage. The normal clutch is two or three eggs. These birds have dark grey-brown upperparts. The head is brownish black with a white throat and conspicuous white eye ring. The underparts are white, mottled on the breast and with buff flanks. 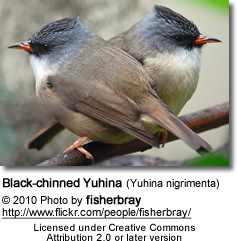 The Blackcap Babbler lives in flocks of four to twelve or more, which help to raise the young communally. It is a noisy bird, and the presence of a flock may generally be known at some distance by the continual chattering, squeaking and chirping produced by its members. The main call is a cha-ka-ta. It feeds mainly on insects, but also eats fruit. The binomial commemorates the botanist Caspar Georg Carl Reinwardt. The genus Mystacornis is now classified as a vanga.